I\m sitting outside and enjoying the last sun and summer we have here in Scandinavia. So I might as well take time to write this blog entry which has been on my todo list for a while. 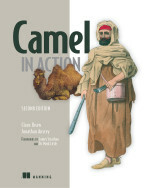 Camel has a built-in expression language called Simple. It has been around for a very long time. It started out as a "templatish" (String interpolation) language, which allows you to define dynamic strings, using token placeholders. In Camel 2.0 we added support for operators in the Simple language. This was a good addition, as it allows end users to use Simple languages for predicates. In other words you have a built-in language in camel-core, which you can use in the Camel routes with EIPs that uses predicates. As the roots of the Simple language was based on its templatish behavior, there parser was implemented using regular expressions. However as people may know, using regular expressions comes with a cost of complexity and being able to read and understand the fairly long patterns. So we have probably reached how far we could go with the Simple language. Another problem with using regular expression is that, as an end user, you must enter the input correctly. If you had some typos in the input, then the regular expressions was not always capable of detecting those errors, and being able to report this as an error. Instead the predicate would fallback and pass as true. This leads to confusion and frustration by the end users, as they do not understand, why all their messages goes to the first predicate in their content based router etc. Knowing this, I took the time to work on a new and improved Simple language. To avoid disturbing the existing source code in the trunk. I setup a new project at github, and asked people in the community to participate. Taariq responded and we worked on this project. A reason for using a repository outside the Camel trunk, was that this was an experiment, and we did not knew when we set sail, if this would become useable and better. And there is a ^ pointer, which points you to the location of the problem. We have support for unary operators specified on the postfix side of the operator. So we could potential add other operators, if it makes sense. Anyway what I wanted to say with this blog entry, is that the Simple language is improved in the upcoming Camel 2.9 release, so it will give you better error details when you have syntax errors, and all your troubles with why the content based router is rouging all messages to the first predicate is solved as well. Excellent. the Simple language is awesome but one of its drawbacks I always had was understanding why your syntax wouldn't work. It's great to see some new mechanisms in place for helping developers! The Simple language is for end users who do not want to add new JARs and use the built-in simple language from camel-core, which in most use-cases is fine. You can chose whatever you want to use. Operator precedence is not yet supported. I will log a JIRA so we can add it for the future. You may work around using a regular expression for the first conditions. Thanks Claus, thanks for the two suggestions, I hadn't considered the regex approach and had gone down the alternate language route, but I will have a think.